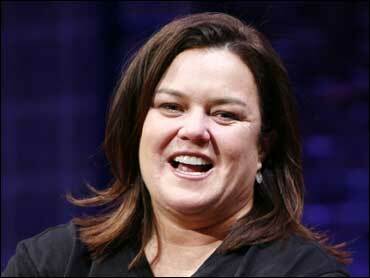 Rosie O'Donnell is known for speaking her mind, but she tells The Showbuzz exclusively that when words become too heated, she gets creative. In a video posted on her blog Friday morning, O'Donnell used collages of photos and newspaper articles showing her year on ABC's "The View." In a separate video entry posted on her blog Saturday night, O'Donnell says Hasselbeck called after their now-infamous argument on "The View" and spoke to O'Donnell's partner Kelli. But O'Donnell says she didn't speak to Hasselbeck and "probably won't." She says they exchanged e-mails. O'Donnell quit "The View" after she called Hasselbeck "cowardly" for not defending her when critics said she compared U.S. troops to terrorists. During the argument, the director used a split screen with O'Donnell on one side and Hasselbeck on the other. She says when she saw the split screen that's when she "knew it was over." She has said it made "The View" look like "The Jerry Springer Show." "The sad thing is you don't get to say goodbye to the staff people that you love," said O'Donnell, praising the show's producers. She also noted that the rumor she trashed her dressing room before leaving wasn't true, joking that her partner Kelli says she's too lazy to trash anything. "I've never trashed anything, frankly," said O'Donnell.